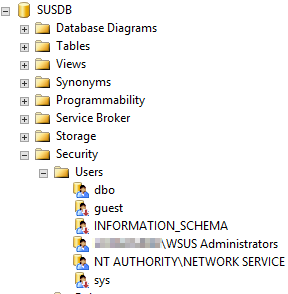 Opening SQL Server Management Studio, I navigated to the SUSDB. Expanding users showed a user for NT AUTHORITY\NETWORK SERVICE. I next opened Security -> Logins and could not see a login for NT AUTHORITY\NETWORK SERVICE. 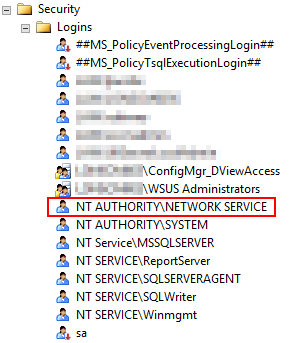 I added a login for NT AUTHORITY\NETWORK SERVICE and started the WSUS service. this resolved the problem. This entry was posted in System Center Configuration Manger and tagged sccm, System Center Configuration Manager, wsus on May 5, 2015 by richardstk.